The P-8 Poseidon, an aircraft that has been levitated in public awareness by glowing news reports during the search for MH370, has now been spotted sporting a massive ventral radar system, one that has a very shadowy past. Exclusive pictures obtained by Foxtrot Alpha, taken by aviation photographer and friend of the site Russell Hill at Boeing Field in Seattle, where P-8 testing continues to take place, show the installation of the huge pontoon-like pod carried on the Poseidon's forward centerline. This boxy appendage is none other than a new and improved form of the shadowy Littoral Surveillance Radar System (LSRS), known as the Advanced Airborne Sensor (AAS). This large flying radar was originally born as the AN/APS-149 in the highly classified "black" world. The basic goal of this advanced radar system program was to provide multi-function moving target detection and tracking, as well as high resolution ground mapping, all at standoff ranges. Additionally, the LSRS needed to work in over-water and over-land scenarios, including the area where those two mediums meet, known as the "littoral zone." This geographically complex coastal region has proven to be a challenging environment for traditional radar systems, and the Littoral Surveillance Radar System, which began development in the middle of the last decade, was designed with it primarily in mind. The LSRS has been quietly flying on a small number of Navy P-3C Orion's for some years, and the results have been described as "game changing." It is said the sensor is so sensitive that it can even pick up a formation of people moving over open terrain. Also, the speed of the system's double sided AESA array allows for multi-mode operations at one time with near 360 degree coverage, meaning that scanning, mapping, tracking and classifying targets can all happen near simultaneously, resulting in massive amounts of data for multiple platforms and decision makers around the theater and beyond to exploit. It is also said that the system works incredibly well for tracking high value targets, and is able to consistently follow their vehicles, map the locations they frequent for movement, and basically make it very hard for them to hide. The more advanced Airborne Aerial Sensor seen in the recent pictures from Boeing field has to be sensitive and smart enough to detect and track moving targets, otherwise known as moving target indicator (MTI) mode, on the shore and at sea at the same time, while also providing extremely high resolution synthetic aperture (SAR) and inverse synthetic aperture (ISAR) radar capabilities. In synthetic aperture modes, the AAS provides picture-like synthetic radar imagery of both inland and ocean areas at the same time, and would offer fine enough resolution that targets could be further investigated and classified without relying on optical sensors. In fact, the system should be able to accomplish this automatically much like MQ-4C Triton Broad Area Maritime Surveillance unmanned aircraft system. The AAS's ultra fast scanning active electronically scanned array (AESA) antenna system, tied to advanced computer processors, would theoretically allow the P-8 to detect a moving target in a cluttered bay or inlet, and then shoot a powerful and tight beam of radar energy at that target to take a "SAR picture" of it and thus judge its identity. If the contact is deemed hostile, the radar can continue to track the target as it moves while still scanning for and tracking others as well. This data, which can be collected by a P-8 well over a hundred miles away, can then be transmitted via data link off the aircraft for exploitation by other weapons platforms. For instance, once a P-8, orbiting over a hundred miles off an enemy's coast, has identified a hostile patrol boat guarding its homeport, it can send that "target track" to a Super Hornet, flying about fifty miles closer to the enemy's shore, and request an attack. The P-8 has done this via using its Advanced Airborne Sensor to detect that ship's motion amongst the port's clutter, and then by instantly employing a beam of radar energy to survey and classify the target. The Super Hornet crew can then fire a standoff missile at the target, such as a SLAM-ER. The Super Hornet would be receiving the P-8's radar data on the target in question continuously via data link, and would be forwarding this information in real time to the missile as it makes its way toward the hapless patrol boat. Once the missile reaches the point at which its own terminal guidance sensors can lock onto the patrol ship, the data link is no longer needed and the targeted ship will either be destroyed by the missile or would have to be re-attacked. The Poseidon can also deliver a damage assessment analysis via generating a SAR picture of the target and watching its telemetry after the missile's supposed time of impact. Tests like the scenario explained above, using "third party" targeting data to hit moving targets with networked weaponry, have occurred in building succession over the last decade and now include the use of standoff gravity weapons against moving targets. Not only is a P-8 packing the AAS, a strategic juggernaut and a force multiplier for many "shooters" and decision makers in the combat theater, but it also gives the Poseidon its own super sensor for which to rain hell down onto the enemy. The P-8 is no airliner, it can pack a serious punch. Its wing hardpoints and weapons bay can carry both standoff and direct attack munitions, and in the more pervasive of air combat environments the P-8 does not need a Super Hornet or a Tomahawk cruise missile to do its reaping. It could detect that same patrol boat as we just hypothetically discussed and pickle off an advanced small diameter bomb of its own, for which it will be able to carry dozens. This weapon has a glide distance of up to fifty miles when launched from on high. Once again, using a the AAS's targeting updates that are broadcast via data link to the weapon for navigation, the small winged glide bomb would make its way within deadly reach of its target. By giving the P-8 standoff weaponry, and a radar that can take full advantage of it, the "kill chain" can be shortened dramatically. Additionally, a P-8 acting as both the sensor platform and shooter frees up valuable tactical assets to do other things in other places, which is a huge plus in an age of shrinking defense budgets and aircraft inventories. 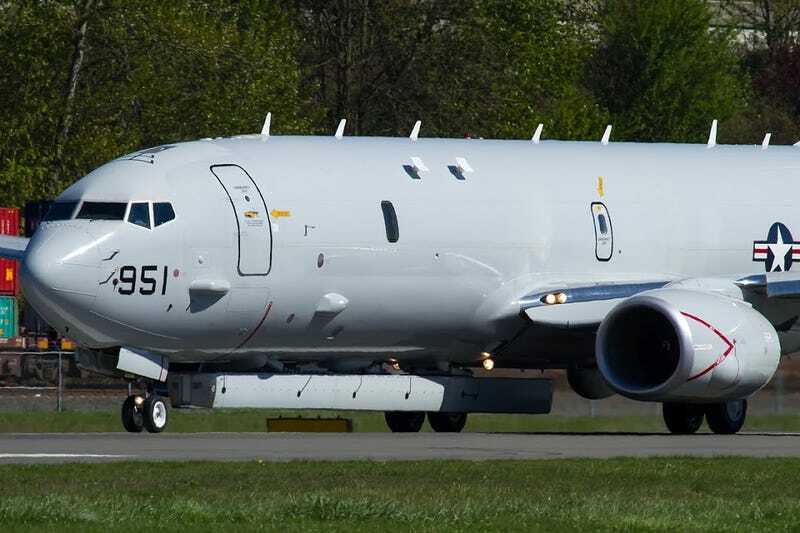 The P-8/AAS pair's third party targeting capabilities may also be a better alternative to using drones to attack high value targets in "sensitive" areas of the globe. A standoff missile, that uses the AAS's radar data, launched from the P-8 loitering far off the coast of a lawless, or even semi-friendlynation, may be equally, if not more effective and less risky than deploying a slow moving and detectable Predator directly over the target in question. What is also so promising about the AAS is the fact that it can work strictly over land when the mission dictates without having to optimize the sensor package physically. In this role the P-8 and its advanced radar system would be working in a very similar fashion to the USAF's E-8 J-STARS aircraft, a reality that some say led to the radar's deep classification in the first place. A similar sensor to the AAS was originally intended for the USAF's E-10 "do everything" sensor and command aircraft. When that program fell apart, the Navy may have been left with a radar that is far superior to what is mounted on an entire fleet of USAF 707's, which consists of very old airframes that have a high cost of operation. In other words, the J-STARS fleet could have been vulnerable to the Littoral Surveillance Radar System's own success. With this in mind, compartmentalizing the program deep within the Navy may have saved it from being shot down via the boys in blue who would protect their existing, even if potentially inferior, ground moving target indicator mission at all costs. Although some of this is speculative, this same story has come up again and again, both in the press and in my own discussions with people associated with the communities that deployed and developed the LSRS. Beyond the AAS's primary modes of operation, there may be other uses for a large flying AESA array with plenty of power available to flow through it via the P-8's large electricity generating capability. These include detecting and tracking low flying and stealthy cruise missiles as well as electronic warfare. Both of which are high priorities for the DoD right now. On the electronic warfare front, much smaller AESA radars are known to be capable of jamming individual enemy radar systems, producing fake targets and even frying the enemy's electronic components via hitting them with a very tight and powerful beam of energy. Even cyber attack is said to be well within the AESA array's potential playbook. Considering that the F-35, with all its electronic warfare and stealth capabilities, will most likely still need standoff jamming support during operations in contested airspace, a large array like the P-8's AAS could be just what the Navy, and the USAF for that matter, ordered. Being able to fly far outside the enemy's surface to air missile engagement zone, for long periods of time, while firing invisible beams of energy that confuse, fry or corrupt an enemy's air defense systems as they come on line to threaten coalition aircraft, would be a highly sought after capability. Also, AESA arrays are known to be the ultimate in high speed communications transmitters, and a P-8 equipped with the AAS while working as a battlefield data fusion center would be able to send a massive amount of information far over the horizon, in a secure manner, all in a blink of an eye. The sudden arrival of the AAS on the P-8 Poseidon is just another aspect to the aircraft's growing capabilities and reputation. Although the airliner turned maritime warrior has had teething problems, and some doubt it abilities to operate in the low level patrol environment, the concept of finally building a large economical aircraft capable of long duration flights, and that you can attach seemingly anything to, including weapons, is becoming a very attractive concept, one that many of us have been predicting would be a game changer for years. For a general overview on P-8 you can take a look at Boeing's brochure here. Photo credit: Russell Hill, USAF (JSTARS pic), Boeing (networked P-8 and USAF P-8 rendering), P-3 public domain.